Rock Star Real Estate: Advance Approval vs Pre-Approval: what's best? Advance Approval or Pre-Approval: what's best? ADVANCE APPROVAL OR PRE-APPROVAL: WHAT’S BEST? What is this mysterious Advance Approval? If you have been already considering buying a house and need a loan, then you have probably already heard about pre-approval. A Pre-Approval is a DU (desktop underwritten) approval, meaning that a lender uses an automated program to qualify you. An Advance Approval is a fully underwritten approval, meaning that a human is going to look at your files and vet your financial qualification. Most lenders will only be able to give you a pre-approval, and odds are you are not separating your offer in any way as you will also have other buyers with pre-approvals submitting an offer. A fully underwritten approval will separate your offer from the rest. The heavy lifting takes place before a buyer is in contract and deadlines are in place. If problems must be addressed or if additional documentation must be obtained, it will happen in an environment of far less stress. By the time your Advance Approval is complete, you can offer to close very soon, waive or shorten loan contingency (in many cases and at your discretion), and your offer will thus be very strong. In a fast-paced market and competing against all-cash offers, time is money and sellers are highly receptive to a fast close and a solid approval. Looking at the picture then, it really depends on the market. If you are looking to buy in a competitive area like the Eastern Sierra can be, it might be helpful to have an Advance Approval on your side: this will assure you the best outcome of the offer you are going to make for your new dream house! 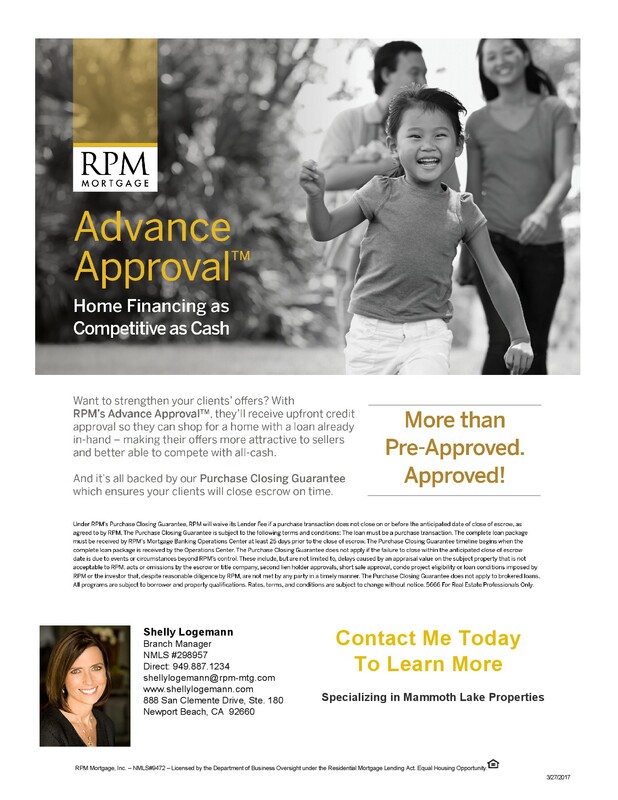 If you should be interested in more information, Advance Approval™ with RPM Mortgage is just one of many good options. We are available at any time to discuss with you all the steps necessary to buy a house, define the best strategy for your situation, and to guide you through the whole process.